I, like most other Americans grew up on breakfast cereal. 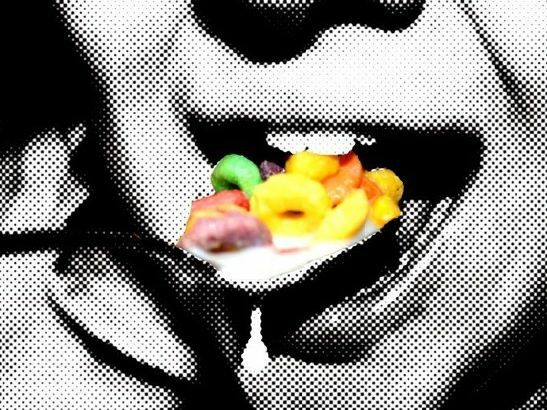 Cereal is a marvel to behold, and sometimes even to eat. But it does seem strange to me, to open a box, shake a bunch of dry, processed pellets out into a bowl, pour milk over it, and call it breakfast. Seems odd indeed. Don't get me wrong, I love me some breakfast cereal every once in a while, but I like to think that my palate for my morning meal has matured past Honey Nut Cheerios. My issue with cereal (I actually have a few, but for the sake of sticking to the point, I'm going to pretend I have one), is that it trains people, from an early age, that breakfast is supposed to be sweet. Even "basic" cereals like Corn Flakes (my personal favorite still to this day) have sugar in them. Then we've got pancakes, waffles, danishes... All sweets. And what a way to start the day?! Barely any sustenance, just sugar. I'm over it. Yes, eggs and bacon are also a staple for breakfast here, but those seem less like everyday fare (and with good reason too). But we're still stuck in the idea of foods being relegated to certain meals only. Sandwiches are for lunch. Soups and stews for dinner. Eggs of any kind, are reserved for breakfast. It's kind of lame if you think about it... we have this massive array of foods at our disposal, and it's always the same things to eat. If you Google 'breakfast' images, what do you see? Waffles, pancakes, bacon, eggs and sausage, cereal, croissants. I say to hell with all that! MIX IT UP. I'm not talking pancakes for dinner, I'm talking about rethinking breakfast completely. Whole grains, soups, stews, stir fries, noodles, anything is game. Breakfast really IS the most important meal of the day, and should be regarded as such. None of this quick bite to eat on the way out the door. No more eating a danish and a coffee at your desk, or, gasp! an egg mc'crappy sandwich. Be good to yourself, and take some time to make, or sheesh, at least heat up, a filling, healthy breakfast. Whatever it is, aim for having at some form of protein and fat for breakfast, as these macro-nutrients will not only leave you satiated, but they break down slower in your body, leaving you full for longer. This means you can ride your breakfast wave easily into lunchtime without getting the 11am munchies. A few weeks ago, Mark Bittman, food writer, cookbook author, and New York Times blogger posted an article about eating whole grains for breakfast. I'm a huge Bittman fan, and was really inspired by his article. I have probably made his recipe for Coconut Oat Pilaf twenty times since reading this article. It's seriously THAT good, and THAT easy. It's sweet, savory, and spicy all at once, and the spice combinations, simple as they are, marry in such a complex and delicious way. His recipe calls for steel cut oats, which I love, and prefer in this recipe, but desperation led me to try both regular rolled oats, and quinoa on different occasions. The rolled oats turned out just as good, with the only difference being in the somewhat more "oatmealy" texture, that is, soft and mushy. Steel cut oats, if you've never tried them (for shame! ), have a more chewey bite to them. "Al dente" if you will. The quinoa was light and airy, and has the added bonus of providing significantly more protein than any other grain. Thinking outside the cereal box for breakfast can be fun! Look to cuisines from around the world for inspiration and ideas. This fun website has lots of fun information about breakfasts from all over. Consider breakfast an opportunity to start your day right, to correct any "wrong side of the bed-ness" that might have occurred upon waking. It's a prime time to start incorporating more whole grains into your diet, and experimenting with breakfast is a great place to begin! If you've got any unusual breakfast recipes or ideas, I'd love to hear them!